For which dates will early entry be available for Roll Call members? 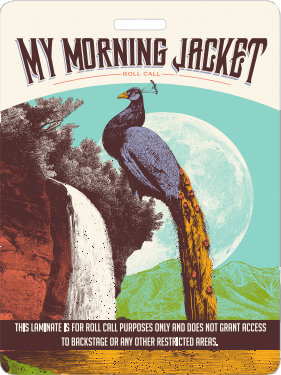 We are anticipating that early entry for Roll Call members will be available at all My Morning Jacket & Jim James shows. To find out for sure, check this page 48-72 hours prior to your show. Details regarding early entry for your event will be provided as soon as they are available. We will not be able to accommodate Roll Call Early Entry at festivals. 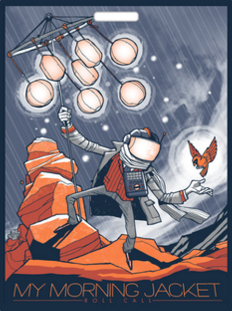 How/Where will I find the Early Entry check in details for my show? Details for each show will be posted at the top of this page about 48-72 hours prior to your event taking place. How will I know where to line up for early entry at my event? Location of the early entry line/check-in will be provided at the top of this page about 48-72 hours prior to your event taking place. How many people are allowed early entry with my Roll Call laminate? Your Roll Call laminate will grant early entry access to the Roll Call member and 1 (one) guest. What should I do if my laminate is lost/stolen/broken or has not yet been delivered? If your laminate has been lost or you have not yet received your membership package, please print off your membership purchase receipt and bring it to the check in location. You must also have a photo ID that matches the name on your receipt. To access your receipt, head over to the ORDERS section of your Dashboard. What should I expect when I arrive for my event? Upon arriving the the venue, you should first make sure you have your tickets in hand. If you do not, please make sure to pick up your concert tickets at will call before taking your place in the early entry line. We encourage that you line up for early entry roughly 30 minutes prior to the listed door time for your event. Early entry for Roll Call members will generally take place 15 minutes prior to the scheduled door time. Which Roll Call laminates will be accepted at these events? These are the only Roll Call laminates that will grant early entry.